In Playerunknown’s Battlegrounds’ Miramar, the unforgiving desert is made worse by one thing: up to 100 people are dumped out of an airplane to fight to the death. Perhaps you are one of the unlucky ones that must try to survive in this wasteland? Our PUBG Miramar guide will show you some of the best places to drop in order to obtain the best loot, but more importantly how to not die before you can really get going. As the second officially released map in Plunkbat, the nuances that work wonders in the Erangel map are certainly flipped upside down in Miramar. It’s a lot more barren, though what it lacks in foliage it more than makes up for with hills. As such, it’s a little tricky to know precisely where the best places to find equipment are. While the blue was a nuisance in Erangel, it’s a more menacing threat here. So in order to get you up to speed, this guide will show you the things you need to know before dropping in. What you see here is going to go into more depth on the Miramar map specifically, but there’s plenty of other things to learn that are useful in the whole of PUBG. Do be sure to check out our PUBG guide hub for more information on the nuances that could keep you alive. Pecado – As soon as you touch down, your priority should be to be the first one into the boxing ring. Should you survive the inevitable firefight, the other good places in the local area are the casino and nearby apartments. Mining facility near Impala – Towards the south east of the map has good stuff, though trying to loot here in the late game is risky thanks to snipers. Water Treatment Facility – Inside the water containers is where the best stuff will be, but enemies do have the advantage of the higher ground. Los Leones – A huge town full of hidden potential, and lots of hiding places for ambushes. Camp Militar – In the far north east, can be good for loot should the flight path be favourable, but expect heavy resistance. Some more isolated places where good stuff can appear includes the Prison and Valle Del Mar. Both situated in the south western corner of the map, there’s a huge amount of risk associated with attempting to loot here. The area does seem to be getting a little bit more traffic recently, but due to the fact that the safe zone is generally quite far away, most will probably focus on grabbing what they can and finding a vehicle to escape. Bridge camping isn’t as viable a tactic here, but some will attempt it so do keep an eye out. What was a mere nuisance in Erangel, the blue zone is a huge thing to consider in Miramar. Since the terrain is far hillier, this gives players far less time to loot and make a move to safety. Dropping into the edges of the map relies on finding a getaway vehicle to ensure safety, while a more central drop location gives you one less thing to worry about. It’s also worth considering that players may be frantically running to avoid death, this could be the chance for some easy pickings. Ideally, you’ve ensured your own safety and have a rifle with a decent scope attached. Then it’s just a case of just waiting for some unlucky sap to show up and popping their heads off with a well-placed shot. Though if you’re not quite safe, running after players that are in the blue while they’re distracted can reap some extra kills. Buggy – fits two people. If you do decide to drive, try to prioritise the dune buggies. They’re a lot more suited to the terrain than a standard car and offer significantly more protection than any dirt bike could. Motorcycle – fits two people. Fast, but barely any protection and can be hard to control. Motorcycle with sidecar – fits three people. Just like the motorcycle, but even more unwieldy. Pickup – fits four people. More protection and people at the cost of handling and fuel consumption. Van – fits six people. Given the desert doesn’t provide much traction, this is definitely not for off-roading. PG-117 – fits five people on water. Not recommended as the only water is far south. Does offer a bit of protection in a pinch though. Aquarail – fits two people on water. Not recommended as the only water in the map is the southern point. Offers no protection. Realistically speaking, you shouldn’t really drive around as the terrain isn’t fantastic for getting around at speed. Sometimes though, driving around is unavoidable thanks to the blue zone of doom encroaching on your position. If at all possible, get somewhere as safe as possible before getting as far away from the vehicle as you can until you know it’s safe. Should you need to move again, be sure to look out for potential snipers before driving away. 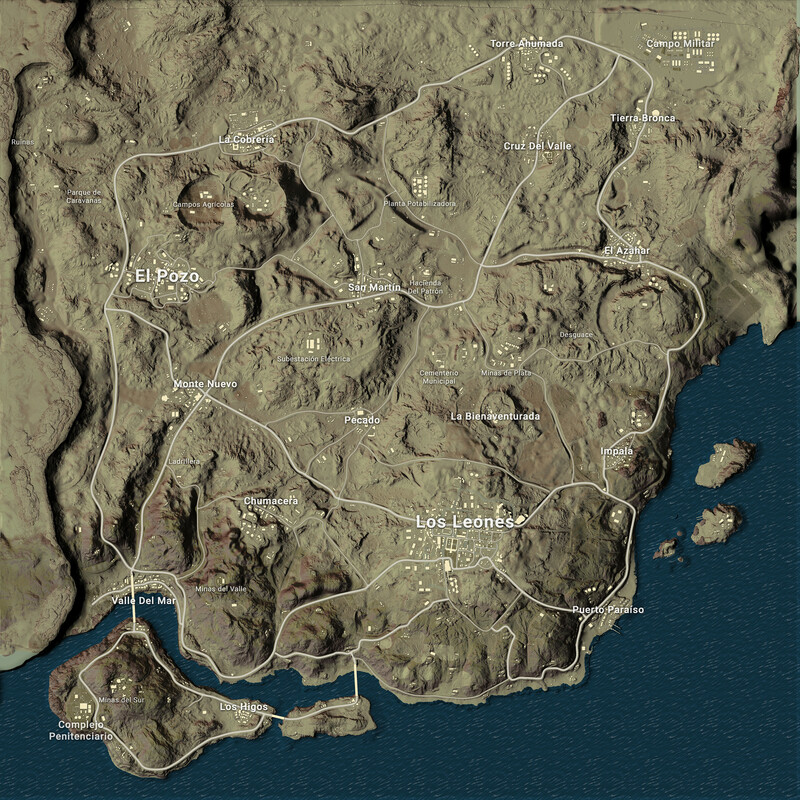 Perhaps more than any other map in PUBG at this time, Miramar is definitely catered for snipers and camping. While there’s no tents that you can pitch, hiding behind the aforementioned crags can mask your presence, especially when at the top of a rather large hill. You won’t see many people, but those you will see will likely not know you’re there. Certain weapons are better for ambushing foes than others. For a summary of weapons found in the game, head on over to our PUBG best weapons guide. As for what’s particularly useful in Miramar: If you find a 4x Scope, make sure to snag it as it’s useful for long-range encounters, as well as a decent rifle to mount it on. Due to the amount of players found outdoors, shotguns have very limited use, while the bow and arrow is practically useless despite the silence it offers. Should you find suppressors, they can help mask your whereabouts a little bit, giving you a margin of error. Miramar’s defining feature is that it is incredibly hilly. This can be used to your advantage in certain circumstances, such as lurking nearby a recently dropped crate and waiting for an unsuspecting victim to make their appearance. Given how sparsely the fauna is distributed, there isn’t really a lot of point-to-point cover in the more open areas. Hills tend to have a fair few crags embedded on them, providing decent cover for would-be attackers. While it’s practically impossible to keep an eye everywhere at any given time, try to plot your movements so that you’re not stuck out in the open for too long. Other than the tips mentioned in this guide, there’s a lot of transferable skills that you may have picked up when fighting in Erangel. We’ve also got plenty more tips for you over on our PUBG Erangel map guide, so be sure to have a gander it should you need a few more tricks in your arsenal. Then there’s our PUBG Sanhok map guide for those looking for tips on that pacific island inspired map.